Web Hosting News – Matawan, New Jersey – Constant Hosting, a dedicated server provider, today announced the company’s custom hosting solutions now include twenty-four hour hardware replacement to ensure each customer’s website is up and running at all times. The company maintains a very large inventory of standby replacement parts so it’s able to instantly replace any components that are not performing well. Constant Hosting offers virtual private servers, cloud hosting, colocation and network solutions, and enterprise level services which include custom server packages. The company’s hardware is sourced only from Dell and Supermicro both of which offer top-of-the-line equipment that’s reliable, stable and easily customizable. Individual sever components are selected based on strict reliability and performance metrics that must reach a certain threshold. The company’s innovation and superior products have helped the business win several awards throughout the years. In fact, Constant’s customer service department played a major role in securing insertion into FindMyHost.com’s “Guaranteed Host Spotlight Page.” FindMyHost.com is an industry review magazine that boasts a large readership. Webmasters and small business owners looking for custom hosting solutions are encouraged to visit Constant’s website today to take advantage of the company’s special offers. 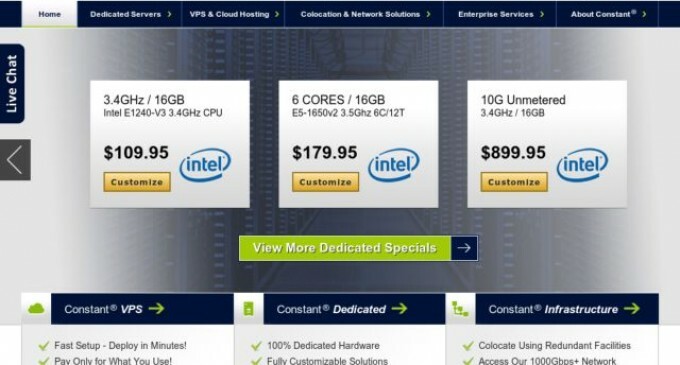 Constant’s virtual private severs start at only $19 a month and dedicated servers are offered at $149.99.